The Ocean Beach Historical Society held their monthly meeting on January 21st. The guest speaker was local photographer Steve Rowell who has been capturing the spirit of OB on film since the 1960’s. Steve treated the audience to a slideshow featuring the birds of Ocean Beach and Loma Portal. Which included everything from our local Red Headed Conure parrots, to the amazing blue herons and even a wayward flamingo that found itself passing through OB. The show ended with an in depth look at the lives of our local Osprey family from nesting to hunting and raising their young. If you missed the show, you can see many of the pictures that were featured here: (). The Rexalt Drug store on Newport has been gone for years. Yet its tall sign in the parking lot behind it has stood like a sentinel ever since. Until last Thursday, January 21, when it proved to be no match for the strong winds that swept the neighborhood. 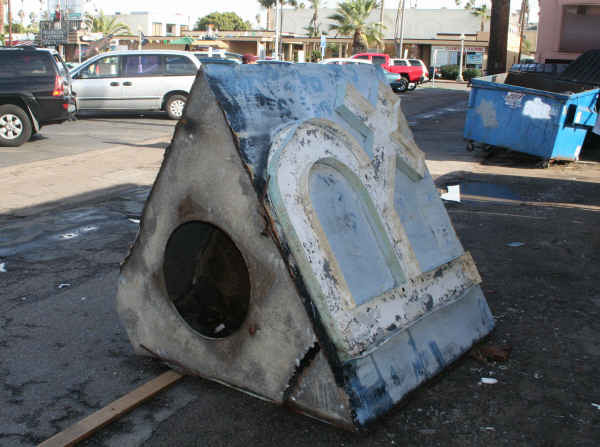 The sign came crashing down, fortunately not damaging anyone or anything of value – only denting a dumpster. Thanks Pat James for the photo. 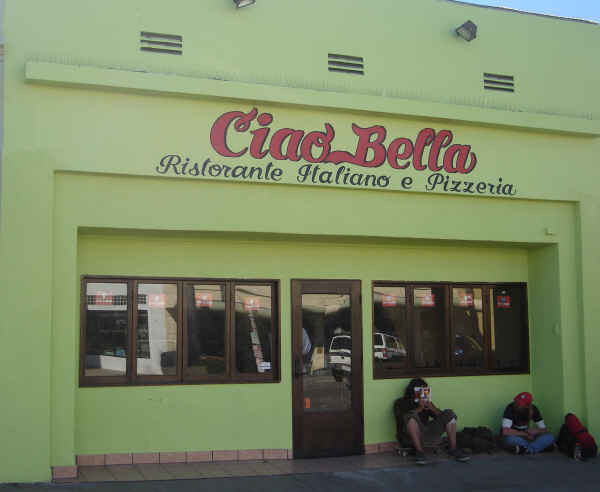 One of the owners of the new Italian restaurant, Ciao Bella, Luigi Toratone, told me that he hopes to open by Valentine’s Day. 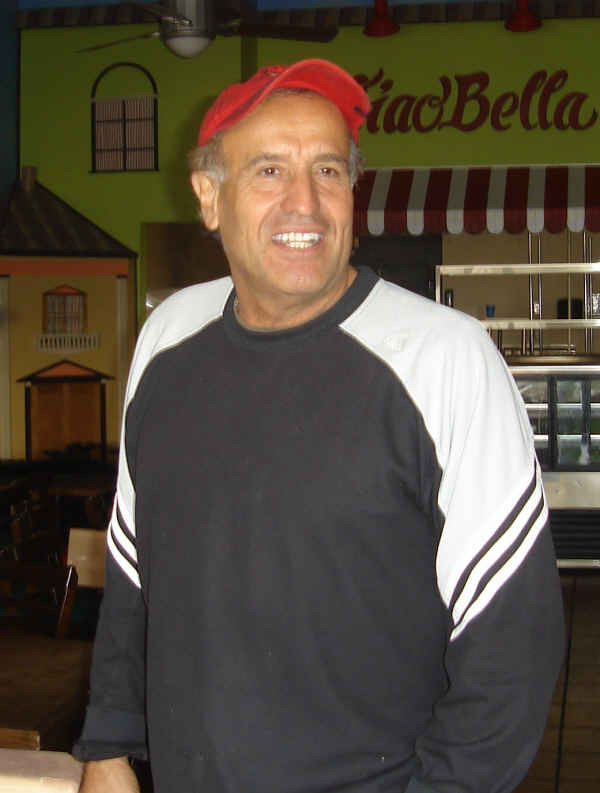 Luigi and his partner, Franscisca Mezzetti, will throw the doors open at 4953 Newport, and allow the public to view their “Plaza” inside. 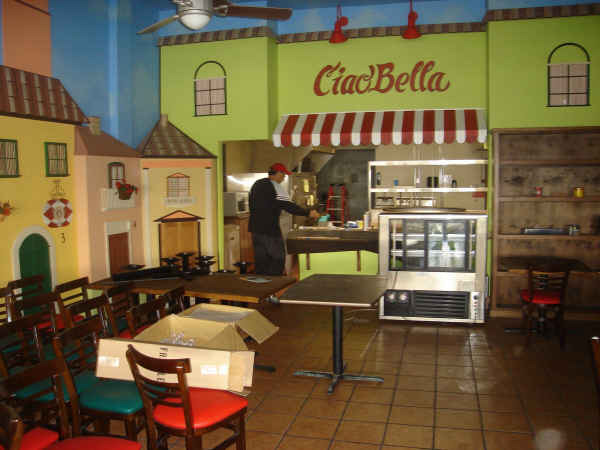 The kitchen just passed inspection, Luigi told me, and everything inside looks ready to go. That's Luigi, striking a handsome pose. Gabriel Berdugo outside his new smoke shop. The OB Surf and Skate Shop moved into the old Rock Paper Scissors building (really the old Bank of America building) and has opened its doors at the new location. 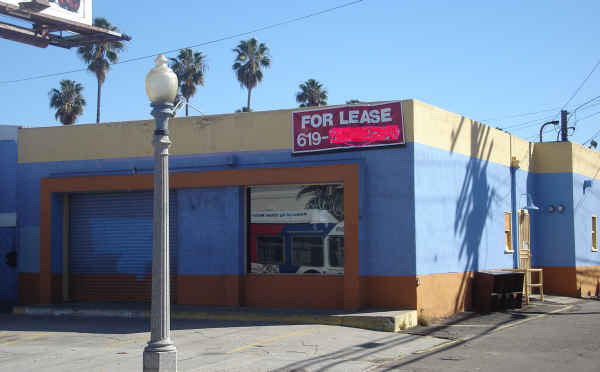 In an apparent OB shop shuffle, a new smoke shop will be opening at the old Surf and Skate store, at 4881 Newport. Called “Stuff 2 Smoke“, the new place will be opening around February 1st, says its owner, Gabriel Berdugo. The new shop has a brand spankin new wood floor, and has been divided up into three separate shops. 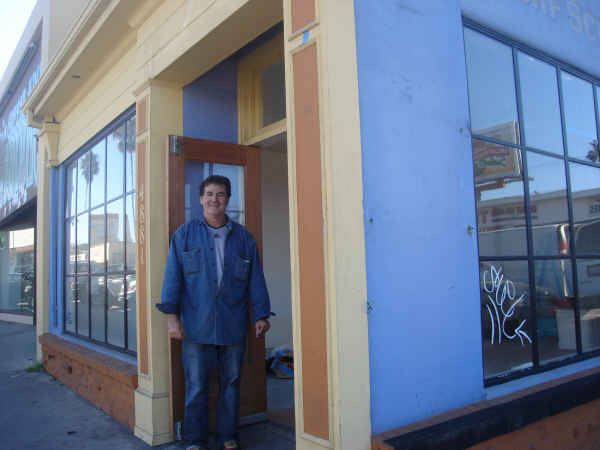 Behind Gabriel’s place, two new storefronts have fresh paint and doors. Gabriel says one will be a soap shop and the other will offer body waxing. Not all is good news on Newport Ave. Rich’s VW – a perennial volkswagon repair place has been forced to close its doors with the new year. We heard that his rent was doubled from $2,000 a month to $4,000. Across the alley from Rich’s VW is another vacancy – the Skate Shop. A “For Rent” sign is up. It was connected to the surf shop, making an “L” shaped area. 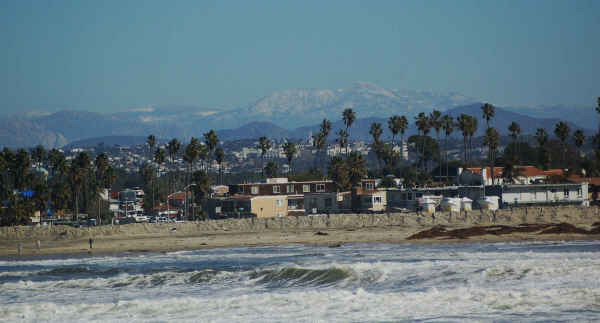 The Planning Board for Ocean Beach is holding its annual election on March 9th. Go here for more details. The Peninsula Community Planning Committee is seeking candidates to run for several open seats. Candidates will vie for the positions during an election March 18 at the Hervey/Point Loma Branch Library, 3701 Voltaire St. Ballots will be cast from 4 to 8 p.m., with a candidates’ forum prior to the election. To qualify, a person must be at least 18 years of age, be a Peninsula community property owner or resident, or be a local businessperson with a business address in the Peninsula community. Applications can be obtained online at www.pcpb.net or by calling (619) 224-9897. Mail applications to Helen Kinnaird, 3215 Tennyson St., San Diego, 92106. Outside the Ocean Beach Library last Friday, (Jan. 22) 10News cameras caught the sprinklers turned on for more than 25 minutes — which translates into several hundred wasted gallons of water. City Library Director, Deborah Barrow, said that those sprinklers should not have been on. “We are very much aware of the goals of the city. A broken valve meant there was no automatic sprinklers, so someone had to manually turn it on. We’re trying to figure out who that was,” Barrow said. For the remainder of this article, go here. Come celebrate Noon Designs first birthday, on the 4th of February, from 4 to 9 pm. It’s located at 5022 Santa Monica Avenue, one block over from Newport. They will be offering some wine, cheese, and discounts. Plus they will be featuring ceramic artist jo zukovich, tradition pottery by alexandra fallon, & emiy fischer’s spoon rings. My San Diego friends gave me a list of fish taco places to check out: El Zarape, Blue Water Grill, Mariscos German and others. The one place that received the most recommendations was South Beach Bar & Grille. The bar restaurant is in a somewhat touristy and, shall we say, free-spirited neighborhood of Ocean Beach, just south of Sea World. The Baja fish tacos here immediately brought me back to the crunchy, bright, clean-tasting, messy-handling tacos of my college days,… Here, pollock is beer-battered, topped with red cabbage, pico de gallo, crema and a squeeze of lime. This is what Southern California tastes like. Go here, if you don’t believe it. I know, I know, this OB Flashes turned out to be a lot of news from Newport Ave. Some good, some bad. New shops openin’ and old shops closin’. Definitely a sign of the time, what with the OB Shop Shuffle. i’m wondering whether the 10news vid team just watched the sprinkler for 25 minutes or did they report the wasted water to someone in authority while it was still going? 10 news Mike Chen was onsite, I was meeting him to shoot a short piece on the re-opening of the pier…He just happened to be there looking at and taking footage of the pier back in the day !! A legit story and pretty sorry case of waste !! Curious to see if they come on today or tommorow !! Just read on the UT website – the city is starting its dramatic cost cutting with the planned elimination of a handful of fire crews each day. The sad part is that, and I know this from speaking with a firefighter just last week, we are already one of the slowest fire dept’s in the country in terms of response time. Now this. Great. PS – Dont know if this was a ragster, but someone mentions Frank and the Adopt a Pit idea in one of the comments! That would be me. As soon as it comes to fruition, I’m in for a Jackson per quarter. I don’t use the fire pits, but I love ’em anyway. And anything to tweak the powers that be!! Hey Great Unwashed – thanks for the props! Thanks, Lane, for the heads-up. Are you a web designer looking for a way to support your community? The OBTC is looking for help in re-designing our webpage. We need help in getting our message out to the community and you can help us make our webpage more effective. Credit for authorship and design is a great way to market your talents and skills. Send us an email today and let us know if you have an interest!! With so many fine contributing freelance photographers here at the Rag and in O.B. I’m figuring that some of them have studios here too. I’m looking for new quality band shots at a reasonable rate. If that sounds like you, please send us your contact info to: rhythmrancher@yahoo.com Thanks! A power outage about 6 p.m. Wednesday night left more than 4,000 San Diego Gas & Electric customers in the dark, from Hillcrest to neighborhoods near Balboa Park and west to Ocean Beach. A problem with the overhead electrical system is believed to be the cause, but the exact problem has not been determined, a spokeswoman for the utility said. Repairs were expected to be completed about 9 p.m. Seriously Mark. Lime Green was an odd choice. I miss Theo’s. Ari Shaffir tours regularly with Joe Rogan; Nick Youssef performed on the Axis of Evil comedy tour; Mack Lindsay works with Sacredcow.com and was the first comedic headliner on the Vans Warped Tour; and local comic and founder of OBC Steven Kendrick has worked with Ron White, Nick DiPaolo, Doug Stanhope, and many more. The show will be hosted by legendary local OB comedian Jesse Egan. Stand-Up Is Dead will then be continuing to tour and perform in Los Angeles and in Austin at South-by-Southwest. Stand Up is Dead is not a dark show, a dirty show, an edgy show, or a punk alternative themed show of any sort. It is a movement. A renaissance of sorts, Stand Up is Dead has the salt, or if you will, the realness that seems to be lacking in most stand up performances nowadays. There are exceptions of note, but not enough. More often than not, when watching a stand up performance, some portion of the audience is left saying, “Ok, I get it, that was a cute observation, an entertaining pratfall, …But who are you”? And it’s that group of people this show speaks to. Stand Up is Dead is a raw, real, and at times, artistically challenging performance. At the heart of it though, at the end of the night, when the curtains draw to a close….its just flat out effin’ funny. Ocean Beach Comedy is proud to have been bringing the best comics in the business from near and far to perform every Friday night for the last 4 years. The audience and level of talent in the shows keeps on growing at a steady pace, and Ocean Beach is looking forward to having the Stand-up Is Dead crew keep up that great momentum in this upcoming headlining performance. There is also now an open mic comedy show directly before Ocean Beach Comedy. From 6-7 pm, you can check out some young, eager, wacky, and talented new comics that are hoping to make it big. Anyone is welcome to perform, but the list is limited to the first 10 comics that sign up. Check out the guys of Stand-Up Is Dead at Winston’s in Ocean Beach at 1921 Bacon Street on Friday, January 29 at 7 pm for only $5. Tickets will be available at the door. I forgot to link this earlier. 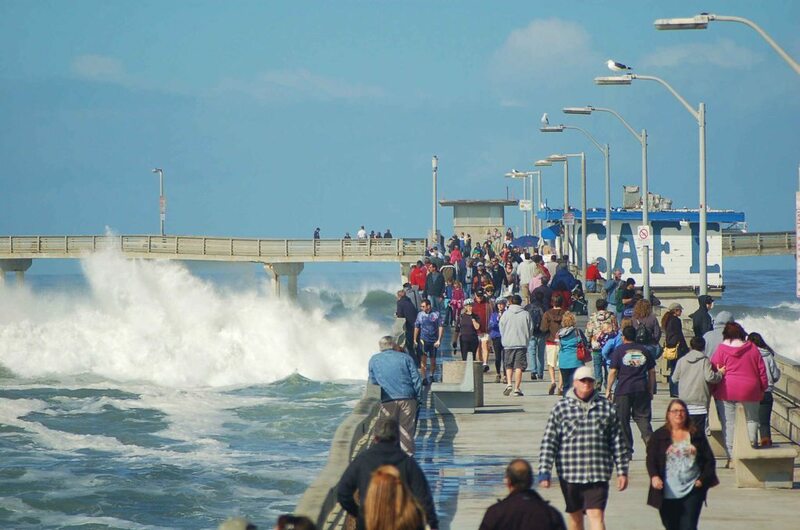 This is some video of the waves from the 23rd shot from the pier http://www.youtube.com/watch?v=DR988ExRzJE you could feel the whole thing shaking and some of those waves made way loud noises as they hit the bottom there at the end of the pier (like at 3:24). Big-ups Jon on the promo of the Stand Up Is Dead show at OBC! Mucho appreciato. It was a great show- if any of you missed it, head out for any of OBC’s shows- every Friday! And a new twist- Winston’s is hosting a mini-comedy-open mic on Mondays from ~ 7:45-8:45 so the tons of ambitious new comics that OBC gets have another weekly chance to work on their sets! Come have a beer and support them! on March 3, 2010 at 6:00 p.m. Mr. McAllister the San Diego County Tax-Treasurer will be speaking to the OB Planning Board on the local economy, county budget issues, and tax collections in the county. He will also be available to answer any questions. The Board meets at the OB Rec Center.